We went to get weighed after our first week on our Sure Slim programmes. The results were very encouraging. I have lost 5.8kg in mass and 3cm off my waistline. This, combined with the fact that I’m quite enjoying the meals I’ve been eating makes me pretty confident that I will make it through this programme and get to my goal weight. I am almost through the first week of a weight loss plan that my wife and I are undertaking. So far it has been really easy for me. I am getting more than enough to eat and haven’t felt hungry at all. I have a long way to go, having to lose 66 kilograms, which they tell me will take about a year. This is most of what I had for breakfast today. 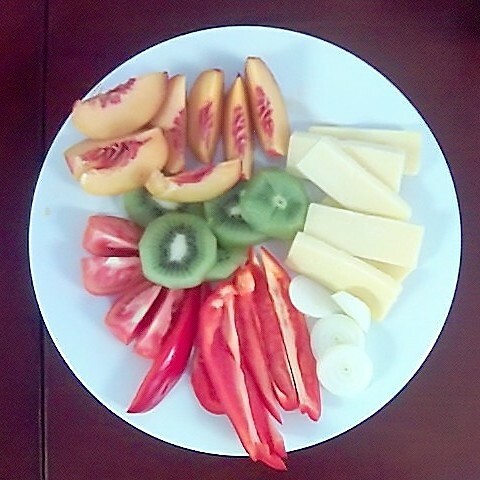 Cheese, onion, tomato, red pepper, kiwi fruit, nectarine you see here, and I also had one Ryvita biscuit and five almonds.